For three months in the middle of this year I had the amazing privilege of looking closer at natural history collections than I had ever looked before. I and my colleagues were able to see mind-expanding detail on the creatures – the hairs on the legs of a fly or the scratches on the exoskeleton of a beetle. Yet nothing quite prepared us for Thembeka Nxele’s excitement at what we were uncovering. 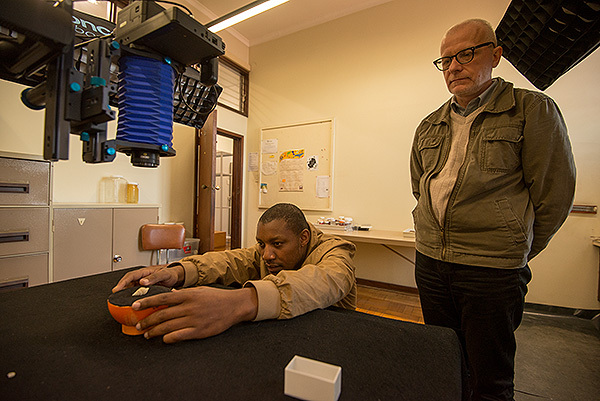 Thembeka Nxele, curator of oligochaeta at the KwaZulu-Natal Museum, places an earthworm specimen below our Alpa 12 FPS camera so that it can be captured, as Timothy Zuma, one of Africa Media Online’s digitisation assistants, looks on. Thembeka is a World authority on African earthworms. She is based at the KwaZulu-Natal Museum. We were capturing the internal sexual organs of earthworms, a procedure which involves peeling open the skin of the earthworm and getting a view inside its “head”. Thembeka was looking over my shoulder at our large Eizo monitor. She had asked me to zoom into a particular area of the image. As we zoomed in to the fine detail, suddenly Thembeka became so excited she was dancing on the spot. When she had calmed down a little, she explained what we were looking at. What we were seeing clearly in the image, what looked like tiny little coils attached to the body wall of the specimen, were sexual organs that in all her years of research she had never actually seen with her own eyes. She had only seen them in textbooks and published articles by colleagues from other parts of the World. She went on to explain the significance of this for her work. “Now I can publish the paper I have been preparing, because I have the evidence,” she said, referring to putting forward an article on her research to scientific journals. Africa Media Online Digitization Assistant, Willem Snodgrass, lining up a mammal skeleton for capture at the Durban Natural Science Museum. 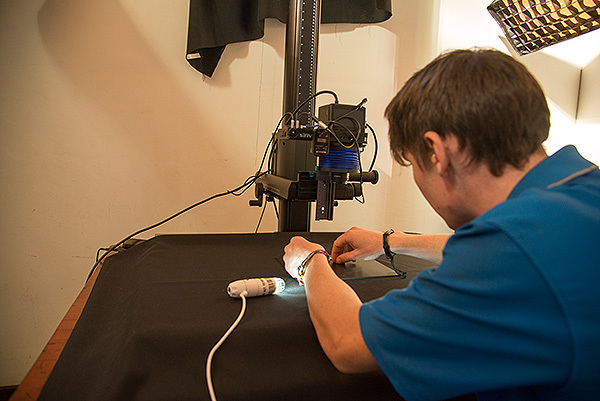 What Thembeka was benefiting from was the incredible resolving power of the Alpa 12 FPS technical camera fitted with Rodenstock lenses and the power of a Phase One medium format digital sensor. Together this was giving significantly more magnifying power than the microscopes the scientists at the museum had available to them. 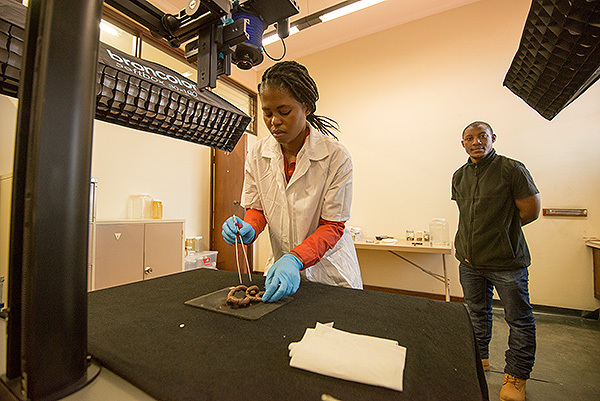 We were at the KwaZulu-Natal Museum carrying out a pilot project to digitise type specimens in a National Research Foundation (NRF) funded project. A type specimen is the original individual of a species that was used to first describe the species as a whole. 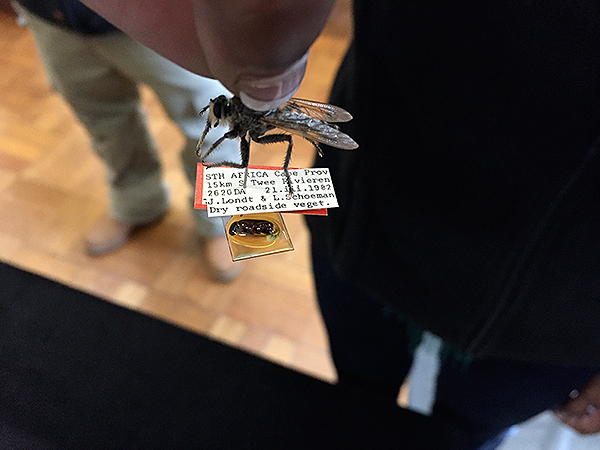 At the KwaZulu-Natal Museum we were capturing type specimens of flies, earthworms, snails and even a frog. A couple of weeks earlier we had been at the Durban Natural Science Museum capturing birds, bats, shrews and mammal skeletons. Dr. Igor Muratov looks on as Africa Media Online Digitization Assistant, Timothy Zuma, lines up a mollusk specimen. Dr. Muratov gave valuable input in the correct alignment of such specimens. The first use we were able to make of our new Alpa 12 FPS technical camera with Phase One medium format back was at the Durban Natural Science Museum. Ornithologist, David Allen was our guinea pig, offering his collection of carefully stuffed bird skins to the enquiring eye of the camera. One challenge of medium format sensors is the shallow depth of field, particularly when the lens is set to the optimum f-stop of 5.6 or 8. 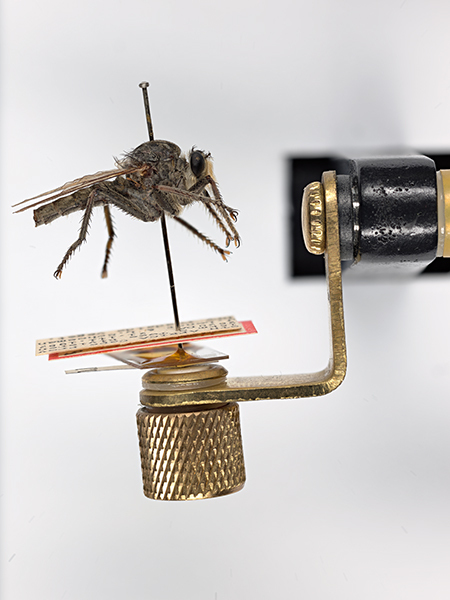 For research purposes the goal is to have the entire specimen in focus so that researchers can see every detail. That, however, cannot be achieved in a single shot. 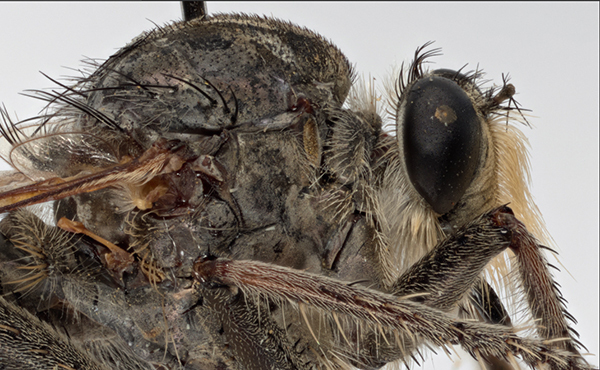 The specimen has to be shot at different focus points and then the various images stacked in focus stacking software to produce a single fully-in-focus image. In the case of David’s bird skins, this was manageable with just 3-4 shots per view (we captured 3 views – top, back and side). When it came to Kirstin William’s far smaller pinned beetles, however, that leaped dramatically to 15 or so shots per view, and by the time we came to fly specimens and Igor Muratov’s tiny shell specimens at the KwaZulu-Natal Museum we were easily doing over 50 shots per specimen times up to five views. It took weeks to do what we had expected would just a few days and the processing work post capture also proved intense. 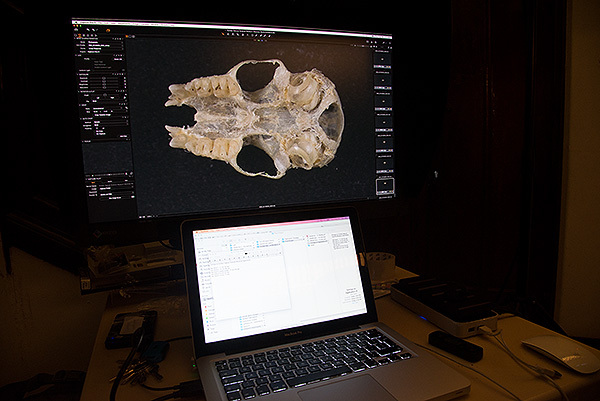 The image of a small mammal skull appears on our Eizo monitor. Numerous shots were taken of the skull at different focus points and then stacked together to produce one fully-in-focus image. 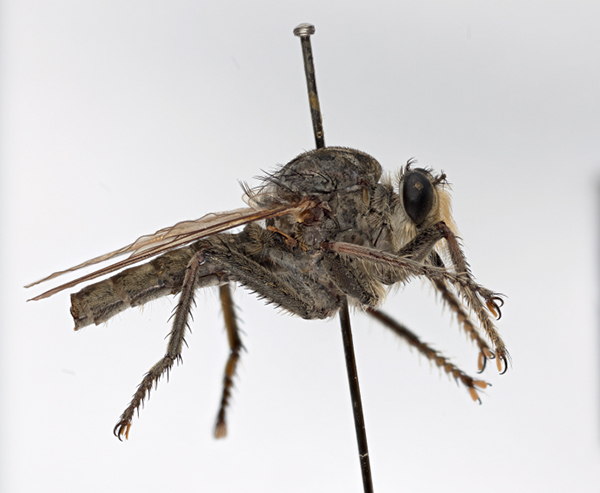 All that hard work certainly paid off, however, in stunning images of valuable specimens from KwaZulu-Natal’s two foremost scientific collections. An unsharpened image of the side view of a holotype Neolophonus seymouri species from the KwaZulu-Natal Museum. The image is at 5% zoom in Photoshop. 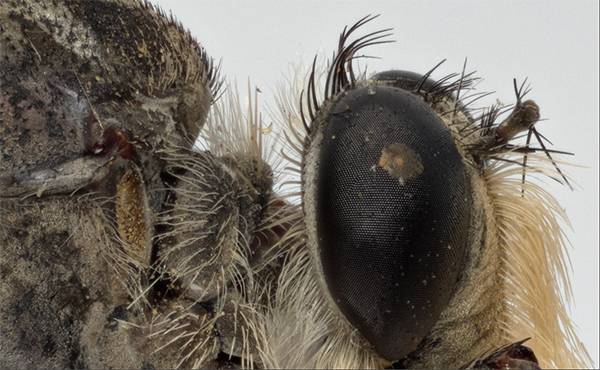 An unsharpened image of the side view of a holotype Neolophonus seymouri species. The image is at 12.5% zoom in Photoshop. An unsharpened image of the side view of a holotype Neolophonus seymouri species. The image is at 50% zoom in Photoshop. These images were created from 18 separate images of this view taken at different focus points. An image of the side view of a holotype Neolophonus seymouri species. The image is at 100% zoom in Photoshop. This image has been given minimal sharpening in line with recommendations for heritage collections.